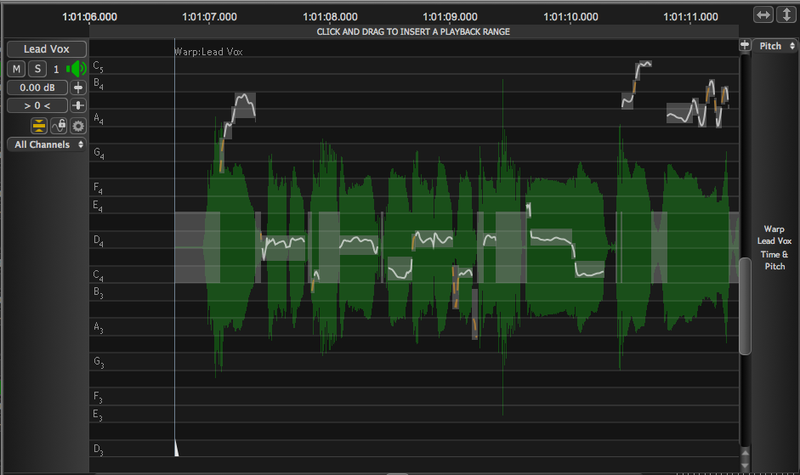 Before editing time and/or pitch, use the Vertical scale (zoom) and Offset sliders to move the pitch trace and blocks into view in the track, and expanded enough to manipulate with the mouse. The result might look similar to those below with pitch contours visible. 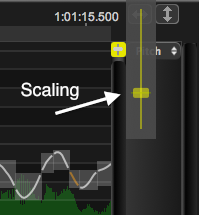 If the drop down Display's Scaling Selector at the top right of the Track window is showing the label "Pitch" (as above), then the display (but not the values) of pitch measurement traces can be "zoomed" (expanded or contracted) in height using the pop-up Vertical Scaling control shown by the arrow at right. In addition, the gray Scale Offset slider can move the pitch blocks and grid together up or down (without altering the notes) to bring the pitch blocks into the visible part of the display. The measured groups of unpitched signal content (such as breaths and other noises) are shown as "Unpitched blocks", which are placed along the waveform's zero line. These blocks cannot be altered up or down (in Pitch). Both Pitched and Unpitched Blocks can usually be stretched or compressed in time and sometimes be moved along the time axis depending on whether unselected adjacent blocks stop the movement. Pitch Blocks and Groups containing Pitch Blocks can be moved up and down (higher and lower in pitch) and left and right (in time), compressed and expanded. If the group also contains Non-pitched Blocks, these will be compressed or expanded in time. Pitch and time blocks can be moved in time if it is not being stopped by a non-selected block. Non-pitched blocks can only be moved, compressed or stretched right or left along the time line and will stay displayed along the middle of the waveform display for convenience.